This Spring you’ll get a chance to become a treasure hunter of secret Uptown wins. And these wont remain hidden from you when you deposit as little as $25 to play with up to 100 Free Secret Symbol Spins! Secret Symbol holds the Aztec Chief within its 5 reels and acts as a wild substitute. You’ll be collecting more Spring wins with help from the Scatter pyramid symbol that triggers up to 10 free games. The Secret Symbol itself helps you amass even more wins with multipliers up to 20 times your original bet! 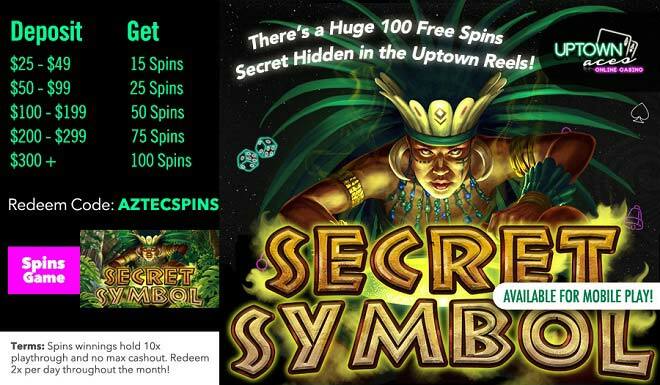 This April uncover up to 100 Free Secret Symbol Spins as you dig treasures hidden within Uptown’s reels!